Fast and easy-to-apply splint for temporary immobilization of the arm, leg or foot. Permits complete padding procedures for effective immobilization. Can be worn during x-ray procedures. Universal fit – fits adults and children. Compact, flat, easily stored and carried. 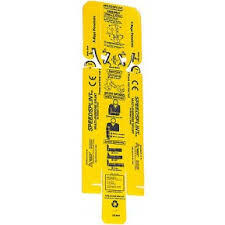 Constructed from lightweight, high-visibility yellow plastic.